In this fun take on corn dogs I decided to combine one of my kids’ favorite foods, hot dogs with boxed cornbread mix and leftover baked beans. I used leftover Crock-Pot Baked Beans when I made it, but you can use store bought canned baked beans too. 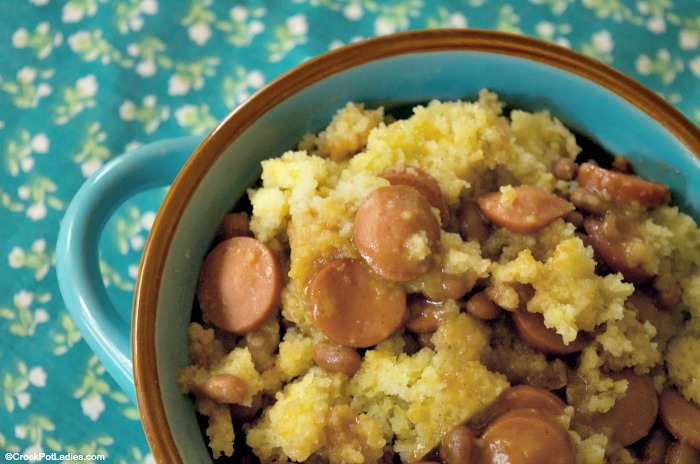 Everything is cooked in your slow cooker until the cornbread is baked through and then served. This turned out to be a huge hit with my kids! In this recipe you will only need a handful of ingredients to make this fun kid-friendly casserole. 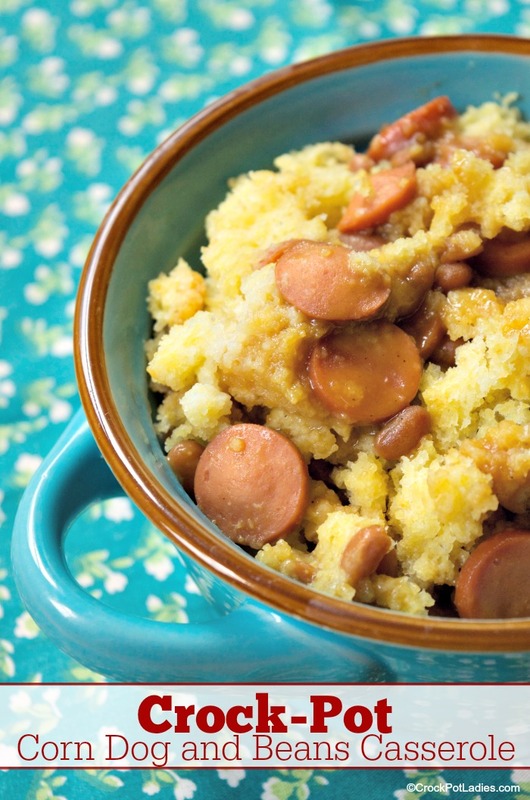 Hot dogs, baked beans and a box of cornbread mix. Don't forget whatever ingredients you may need for the cornbread mix such as milk and eggs! 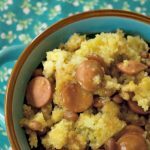 Add baked beans and hot dogs into a 3 quart or larger slow cooker and mix to combine. Cover and cook on LOW for 1 1/2 hours or until the liquid from the baked beans is bubbling around the edges. In a small mixing bowl, mix the cornbread according to the directions on the box. Carefully pour and then spread the prepared cornbread batter over the top of the hot beans in the slow cooker. Recover slow cooker, and continue cooking on LOW for an additional 30 minutes or until the cornbread is cooked through and firm to the touch. To make this recipe gluten free look for a gluten free cornbread mix. We like Pamela’s Cornbread & Muffin Mix. I made this today, but with chili instead of baked beans. Delicious! So glad you enjoyed the recipe Patti! Hope you enjoyed the recipe Laura!